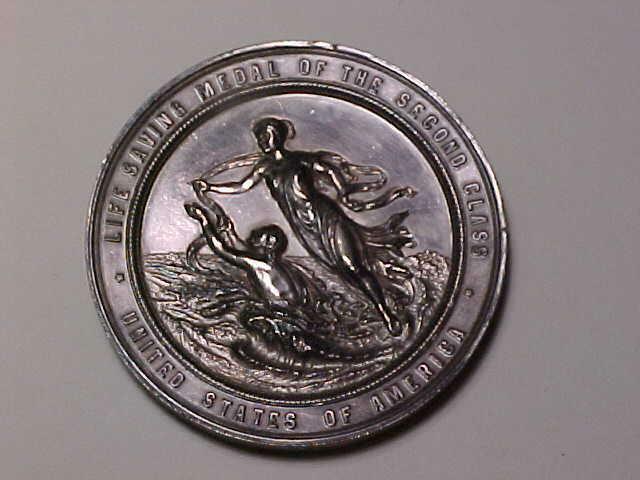 The U.S. Lifesaving medal was established in 1874 for anyone who saves or attempts to save a drowning person from a shipwreck or any other type of water related danger. It was originally granted by the U.S. Life Saving Service through the U.S. Treasury Department (now the United States Coast Guard) and is only awarded to United States citizens whose act of bravery occurs in U.S. waters. Citizens can be awarded a gold or silver medal. Anton Oleson was the head of a lifesaving station in Milwaukee's harbor when on September 9, 1875 the bark "Tanner" was sinking in the harbor. Oleson saved the lives of several people onboard, for which he received this rare silver medal, one of the earliest awarded. This rare WWII jacket was a donation to the Milwaukee Public Museum from its original owner, Staff Sergeant Byron Taylor Jr. A native Milwaukeean, Sergeant Taylor flew 39 missions over Germany with the Air Force. During WWII many airmen would decorate their flying jackets, making them both distinctive and unique. 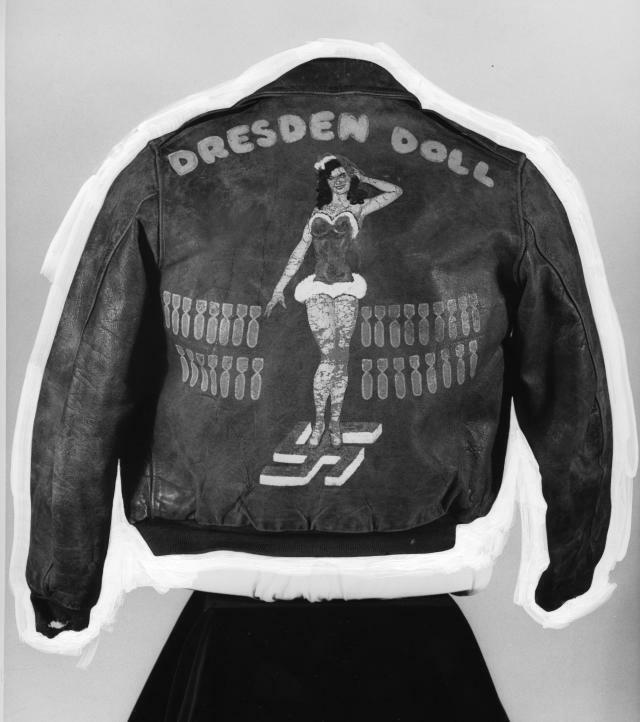 In Taylor's division, all the men had the "Dresden Doll" on the back of their jackets, but each woman had a different face: the feminized caricature of the man who wore the jacket! 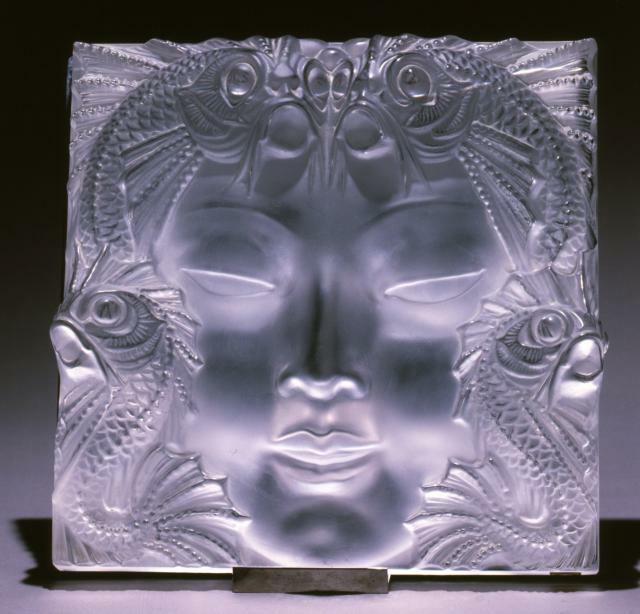 A valuable piece in the museum's glass collection, the Lalique mask is an excellent example of glass artwork. It was crafted by Rene Lalique, known in the 1920s as Europe's master of decorative glass. Although he is reknowned for his work in jewelry, furniture accessories, vases and more, this piece of decorative glass is a product of Lalique's shift in specialization after the world market's collapse in 1929. Most of Lalique's work after the Depression focused on architectural items such as rails and altars for churches and lighting fixtures and wall panels for department stores. Inspired by Japanese artifacts, the mokume vase is Tiffany's recreation of Japanese metal work. This vase contains a square with panels of copper, silver and gold on a sterling silver frame. 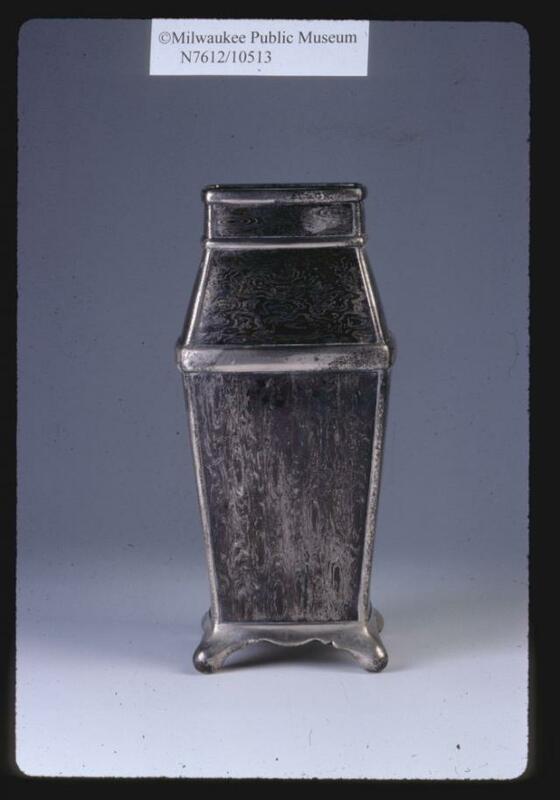 Tiffany and Company created a line of items displaying traditional Japanese metalworking techniques after Christopher Dresser, a long time friend of Louis Tiffany, returned from Japan with several artifacts. 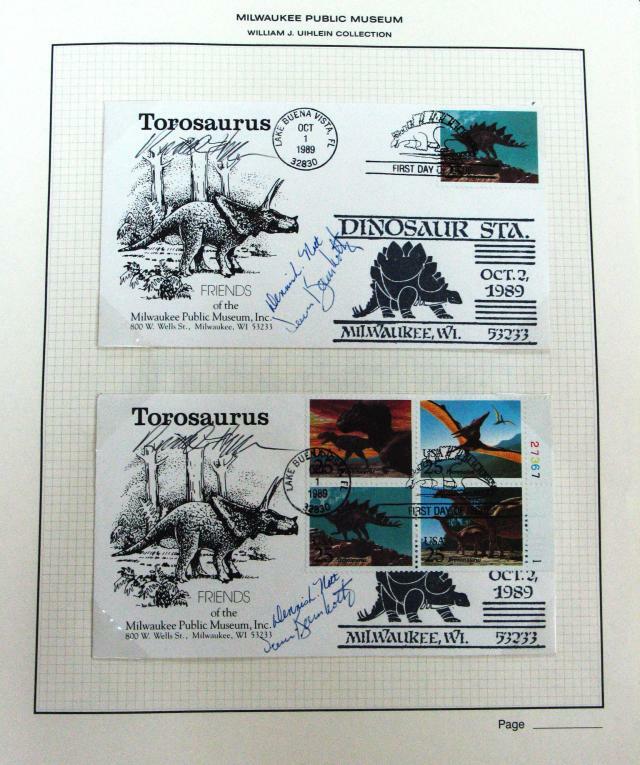 In 1878 Tiffany displayed his work at the Exposition Universelle in Paris, France. The international community believed these recreations to be some of the most important and significant metalworking creations of the time. 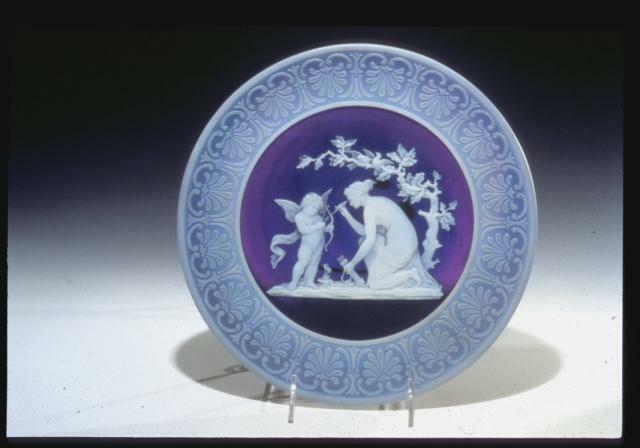 Dating to 1895 and depicting "Venus instructing Cupid," the Northwood Cameo Plaque is unique. Although George Woodall is considered the greatest carver of English cameo glass, John Northwood was one of the first to carve this type of glass and is known to have made only seven works on cameo glass. He sparked a period of Greco-Roman recreations on glass and revitalized British interest in Greco-Roman glass works. 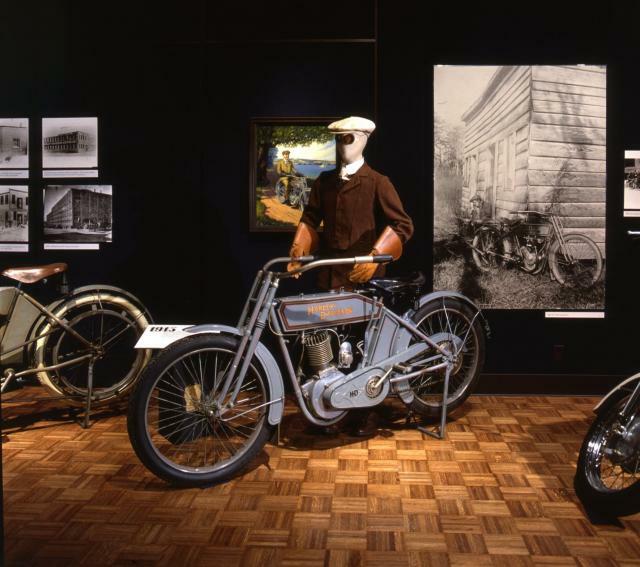 In 1903, Harley-Davidson began its motorcycle business in Milwaukee, Wisconsin. This item, a 1913 Harley-Davidson motorcycle, was manufactured during a time of great production and growth for the company. That year, Harley-Davidson built a new, much larger factory. The following year, production numbers soared to 16,284 motorcycles. After 1914, Harley-Davidson dominated the motorcycle industry. This machine serves as a marker of this time of economic and industrial growth for the Harley-Davidson motorcycle industry. It is currently on display in the Streets of Old Milwaukee exhibit. Unique to firearms history, this flint-lock Patrick Ferguson breech loading rifle is one of only 100 martial Ferguson's rifles made and dates to 1776-1778. Prior to breech loading weaponry, muzzle-loading firearms were used. The breech loading rifle revolutionized firearm warfare with a design that enabled faster reloading during battle. Breech loading rifles had been used for more than 200 years prior to Patrick Ferguson's design, but Ferguson's version of this breech loading flintlock weapon, made possible by improvements in more precise engineering, was a more successful weapon. The Ferguson rifle provided for faster reloading time and a lesser threat of exposure to enemy fire. Had the British adopted this technology during the Revolutionary War, the consequences for the Americans could have been devastating. 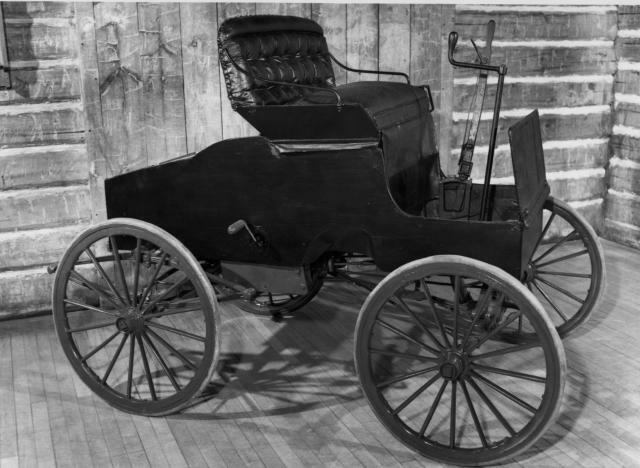 The Schloemer automobile, on exhibit in Streets of Old Milwaukee, was the first internal combustion vehicle to run on the streets of Milwaukee. This vehicle is a product of Gottfried Schloemer's and Frank Toepfer's interest in producing a self-propelled vehicle. After their first attempt, a bicycle-like vehicle that required its passengers to pull a bar back and forth to operate the crank shaft, Schloemer and Toepfer looked to other innovations. Schloemer and Toepfer borrowed the gasoline engine design from the Sintz Machinery Company in Grand Rapids, Michigan. The engine was a single cylinder, and ignition was provided by two steel points which made contact within the engine. The engine was placed below the seat, and was powered by a belt system. Improvements in steering were made in time and other features were added such as brakes. The vehicle was ultimately commercially unsuccessful but inspired others to improve on the design. The car was bought by the Museum in 1920 from Gottfried Schloemer who used it to promote his business. This is the only one of its kind in existence. In 1836 a patent was created for a weapon that used a revolving cylinder coupled with a stationary barrel. This was the first design for a marketable repeating shot firearm. 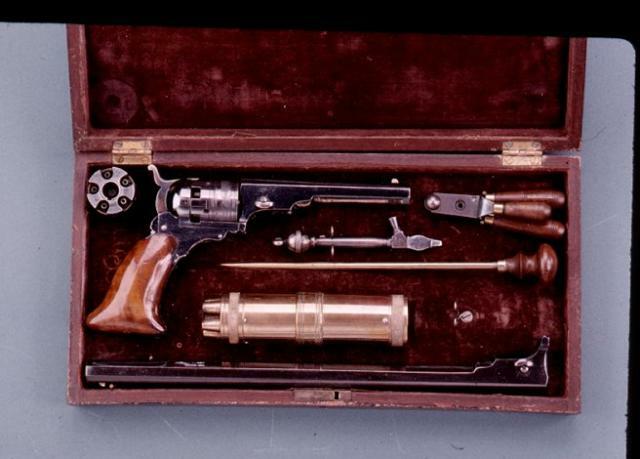 Samuel Colt is attributed with the design of the first firearm under the patent, the Colt Paterson Pistol. A loading lever was eventually added to the design, enabling the weapon to be loaded without disassembly.